Been a while since my last blog entry. Someone make the days a bit longer. We had our second crack at sailing the “Fire Truck” during the Club Point Score race on the 5th of January. We lined up with one Lightweight Sharpie “Lumpy Deck”, One Classic 18, the “Clockwork Orange” and a GP rules 18 “Austar”, skippered by Gary Saxby from UK Halsey Sails. The PRO was Paul Vivian. The race was run on a modified NE course. Start at the club, Red Lightship to starboard, 18’s buoy to starboard, Taylor Street Yellow to starboard, finish at the Club. The crew for the day was Laurie Williamson on the idiot stick, Simon Hunter on the main sheet and Iain Mitchell-Hill up the front. We found out that winged 18’s are not the best boats to sail on the Brisbane River. After spending the leg to the Gateway Bridge dragging the wings in the water, we settled down into the slightly better breeze on the Pinkenba Reach of the river. At this stage “Lumpy Deck” had done a horizon Job on the fleet, With “Clockwork Orange” 2nd. Us on “Fire Truck” 3rd and “Austar” 4th after finding a bit of hard stuff close to the bridge. Both of the Winged 18’s had a swim soon after rounding the Red Lightship. “Fire Truck” was the first to go down after falling into a hole and pulling the skiff in on top of us. “Austar followed suit not long after when the gybe set bought them unstuck. Once back upright both winged 18’s were having a realy good fight downwind untill “Austar” went to close to the northern bank and fell into a hole, giving them another swim. “Fire Truck” continued down the course under kite untill the Graveyard at Colmslie. With the breeze going NW, we decided to drop the kite. Unfortunately, this was just as the boat gave a bit of a shudder and Simon, with his hands on both the Kite Halyard and Tackline, accidentally let the halyard go. This resulted in a bit of a prawn trawl and a swim, allowing “Austar” to sail past us to take 3rd. 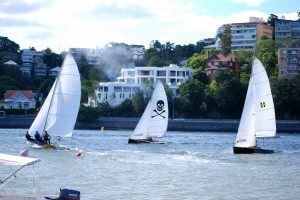 Our next outing was Heat 2 of the Brisbane River Championship. “Clockwork Orange” won the start despite having one crew member taken out by the kite pole on “Argus Tuft”. “Argus Tuft” were two preoccupied with worrying about the “Clockwork Orange” crew and swam on the start line. “Clockwork” and “Fire Truck” had a great race up the river trading the lead several times, even after getting stuck in the wind shadow of the “Pacific Sky” as she left berth and headed out the river. While the lead two got stuck in no breeze, “Argus” made up a lot of ground. Our time came once we had cleared the wind shadow of the wharves and started to get some true breeze. We made some decent ground on “Clockwork” and “Argus” in the less shifty breeze in the Pinkenba Reach. Our crew really started to come together here, with good talk between the guys on how much weight we needed on the wire. We even had time to start concentrating on racing the boat rather than just sailing it. Our race however, was to end before the top mark. A slightly messed up tack saw us in the drink and the skipper taking a trip from the end of the wing, to the mainsail. Seven feet is a long way to fall, and the main showed its displeasure by exploding under the skipper. The main is currently being taught proper respect at the sailmaker’s loft. The race was won by “Clockwork Orange” after using the age old skiff sailors trick of not falling over after “Argus” had another swim at the graveyard. As a crew, we have started to to work the boat out, with what it likes and doesn’t like. Hopefully with a few more sails we will start getting the boat around the track with less swims and more style.